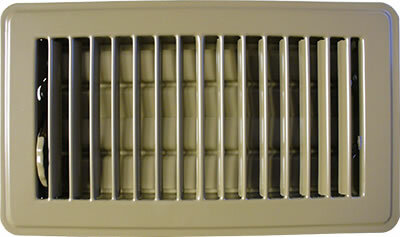 2 X 12 Stamped Steel Floor Register - Brown Discounts Apply ! 2 x 12 floor registers are easy to install drop-in style registers. Metal air diffusers are all steel construction with welded seams for added strength. This 2 x 12 floor register has a functional steel damper that is easily adjusted with your hand or foot. These metal air diffusers offer a clean look with a durable finish. 2 x 12 floor registers are a neutral tan color so they blend easily with any decorating style. These metal air diffusers are a quality product for a great price. ***Hint: The industry standard is to order metal air diffusers using the actual floor hole size and not the register cover size. This 2 x 12 floor register will fit a 2.25 x 12 inch hole opening. 2 x 12 floor registers are also offered in white and sold in a variety of sizes. These metal air diffusers are at a great price point; making it affordable to change all of the registers in your home. Order today!